Project Size: 19,540 sq. ft.
An engineer and inventor, Virgil Morgan tackles a project the only way he knows how: he asks questions and conducts a thorough research. When his aerospace equipment and service company was outgrowing their facility he set out to find the best contractor he could to build his new facility. After a comprehensive search, Morgan selected Fisher. There he found a team able to design a smart facility and built it to deliver on investment. The team set out to create a facility that met the stringent requirements for Morgan’s business of engine hoists, slings and oxygen system service. 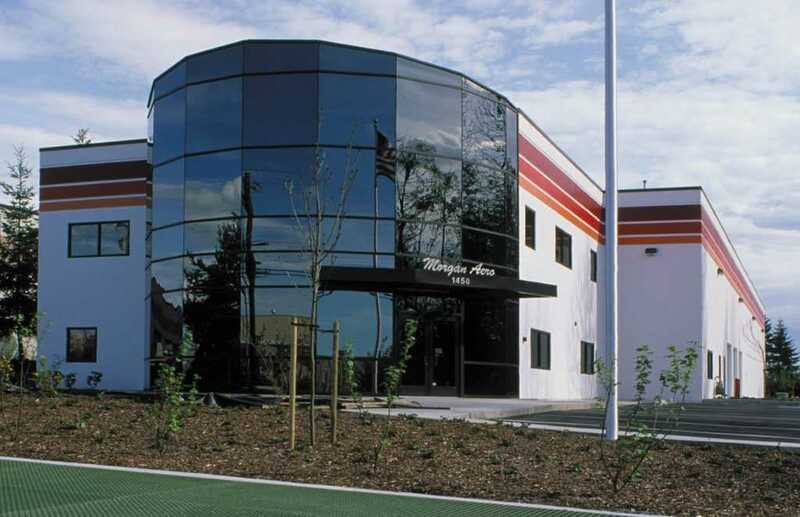 As the exclusive off-load oxygen cleaning contractor for Boeing, Morgan needed clean rooms and waste water treatment capabilities, along with lab space for future product development. Thinking ‘green sustainability’ before it was in the news, the project team created a landscaped pond and fountain in front of the building to cool and recirculate processed water. This solution cut water consumption by 95%. On a fast-track schedule, construction was completed in less than six-months after permitting.